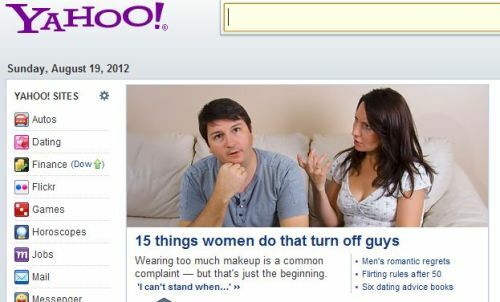 Nerdy Feminist: No, Yahoo. No. So now Jessica Biel is "soon to be Mrs. Justin Timberlake?" 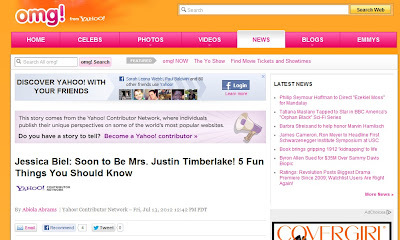 Last I checked, Biel is a celebrity in her own right...I mean, if she started going around identifying as Mrs. Timberlake, it would be one thing (I'd disagree w/ that decision, but at least it would be her choice...) But this is Yahoo just being dumb. What? Did you want to do things just to be you? NAH! It's about what guys like, you silly womern. 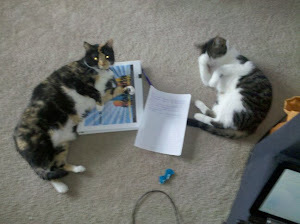 And just today, they're making sure they play their part in another media catfight watch. Gross. You'd think with their new CEO, one of the most powerful women in the business world, Marissa Mayer, they'd be a little more female empowering. But you'd be wrong.